Even a donation of �4 could mean the difference for someone. Alex Gray in the Two Ball Rally challenge. Pic by Adam Law. A Glasgow City Council lorry driver whose life was turned upside down with the sudden death of his brother, is fundraising to help others. Alex Gray, (39), who lives in East Kilbride is setting off with his wife Lynsey and family friend Laura MacDonald on an awe-inspiring challenge to take part in the Two Ball ‘Banger’ Rally. The race will see them drive through nine countries: France, Belgium, Luxembourg, Germany, Austria, Switzerland, Italy, Monaco and then back into France ending up in Nice, having travelled a bum-numbing 1200 miles - in four days! And, the madcap trio will do it all in some style. Their ‘banger’ is actually a Ford Focus, and you won’t miss it either, with its very distinctive ‘flower-power hippy’ styling. It’s been rumoured that the three explorers will be dressed accordingly in an attempt to help raise as much as they can. For Alex, it couldn’t be a better cause. The Samaritans are a cause very close to his heart after his brother Duncan took his own life in 2012. Since then Alex has heartbreakingly had to attend another four funerals of friends who have also sadly taken their own lives. You can donate at www.justgiving.com/maxgroove. The group have already managed to raise £210 of a £500 target, and your donation, even if it’s only £4, could mean the difference for someone with absolutely nowhere else to turn. 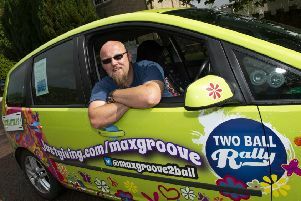 You can follow the trios progress on their Facebook page at: www.facebook.com/maxgroove2ball.